Road trip time! Are you a cross stitcher, quilter, weaver, knitter, crocheter, needlepointer, fly tier, spinner, tatter, jewelry maker, crafter…or anyone who likes thread? 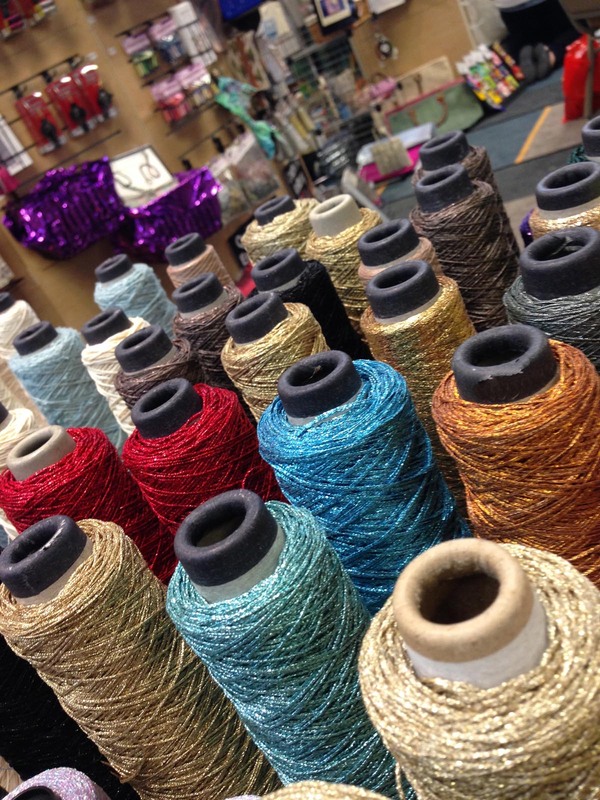 If so, you will want to make plans now for a fiber extravaganza at the Kreinik factory in Parkersburg, West Virginia. We will open our parking lot and doors for anyone who loves fiber. The tent sale runs May 10, 11, 12, and 13, 2017 at the Kreinik thread factory, 1708 Gihon Road in Parkersburg, West Virginia (the historic Mid Ohio Valley area). Ever want to feel like you've stepped into a rainbow? This is your chance. Stop by and enjoy a fun day collecting beautiful threads. FOR EVERYONE: Special needle sale for embroiderers, stitchers, bearers, quilters. …and of course there will be plenty more. We will have cones of discontinued colors (some people are collecting all the leftovers! ), surplus inventory of your favorites, and super sale prices on other unique Kreinik fibers. You also have a chance to meet and get your photo taken with Doug Kreinik. Shops interested in bringing a van of customers should contact Kreinik for details and arrangements, info@kreinik.com or 1-800-624-1928.
Who doesn't love a spring road trip? This one has fabulous fibers as the destination. Bring friends! 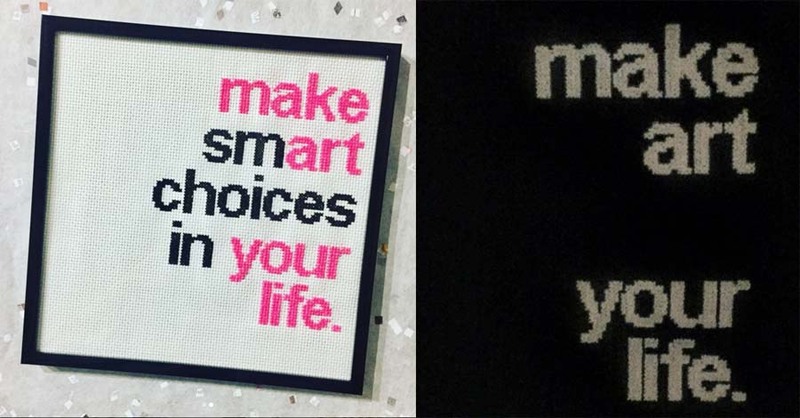 The Freudian Stitch, one of our favorite cross stitch designers, just released a new pattern featuring the motto, "Make smart choices in your life." Goodness, what a great message for all of us that makes a fun, easy stitching project. Even better, there's a secret, just-as-important, message deep within the stitches, thanks to Kreinik pink glow-in-the-dark thread. Take a look at the photo to see how cleverly this is created. We agree! The clean lines of this pattern make it modern, suitable in any decor, and easy to stitch. The message of this pattern makes it relevant for everyone. 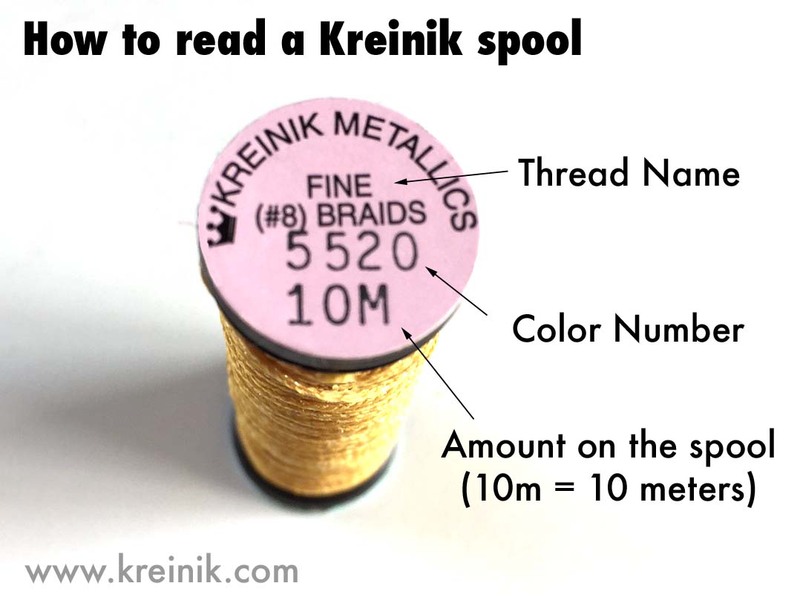 This is your year of becoming a Kreinik thread expert. Hopefully you've enjoyed and learned from the blog posts so far (access them via the dated list on the right side of this page). To reach the next level, you need to know about one of the cornerstones of the Kreinik line: Fine #8 Braid. Fine #8 Braid is possibly the most versatile metallic thread since it can be used by just about every creative technique. It is the perfect size for needlepoint, cross stitch, embroidery, crazy quilting, weaving, bead knitting, bead crochet, tatting, fly fishing, card making, Temari, Hardanger, and more. 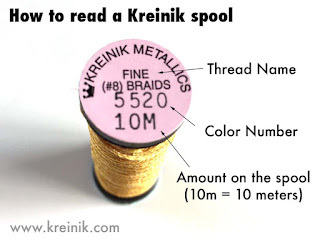 It was the first metallic developed by the Kreinik family in the early days of the thread company. 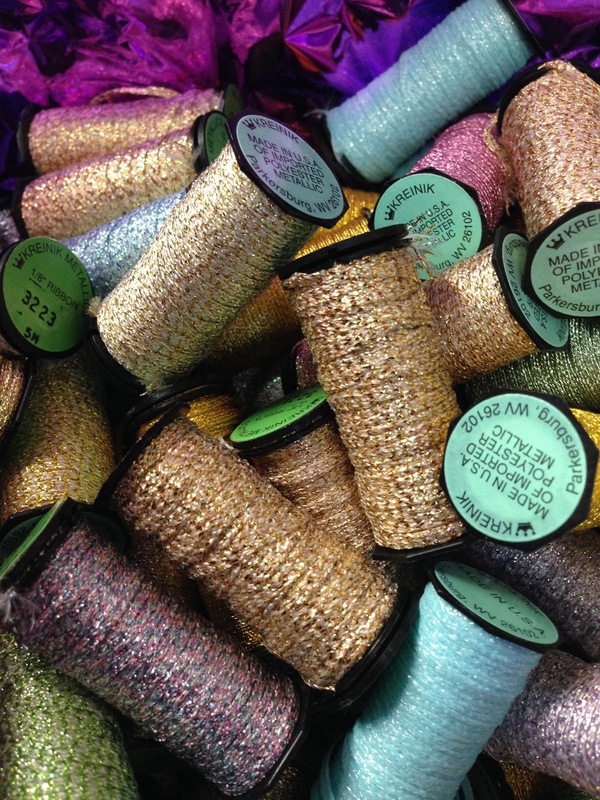 Doug Kreinik fills us in on a little history: "In the beginning, my parents, Jerry and Estelle Kreinik, looked at the market and saw that there was a need for a metallic for cross stitch and needlepoint." Estelle was a needlepoint enthusiast, which is how they got involved in the industry. "They first created #8 and #16 braids in 7 colors along with blending filaments. 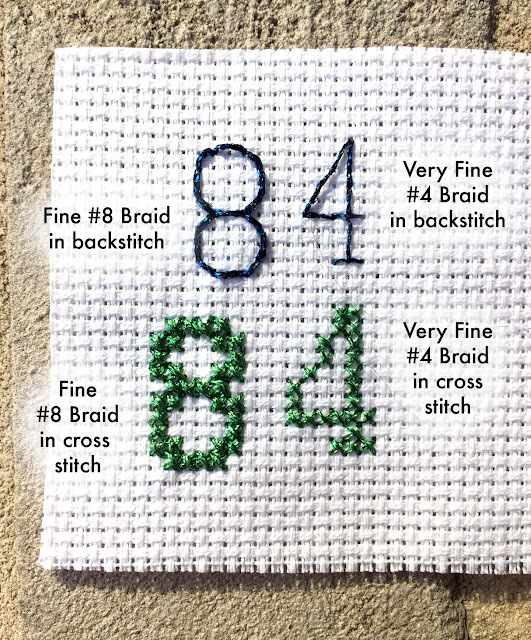 The #8 Braid could be used in both needlepoint and cross stitch," Doug adds. "Since then, #8 has been used in crochet, tatting, smocking, weaving, sewing, quilting, embellishing, rug hooking and even fly fishing bodies." Today we make #8 Braid—we don't get it from overseas or from another company—in our Parkersburg, West Virginia factory. It comes in 250+ colors including basic metallic shades, hi luster, vintage finish, glow-in-the-dark, and holographic. Corded #8 Braid is a bolder version made to resemble real metal threads. 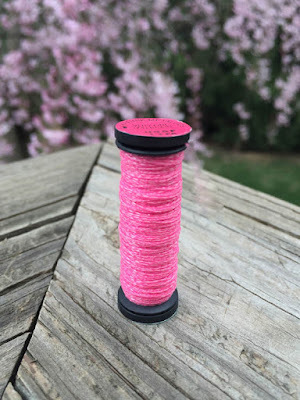 If you haven't used Fine #8 Braid for your creative project, get a spool in your favorite color and try it. You can't hurt it and you will love the bold metallic effect in your design. It brings visual interest, light, and texture that simply makes projects better. SIZE: The number 8 simply refers to the number of raw strands we use to make the size (or weight). Fine #8 Braid is twice as thick as Very Fine #4 Braid, and half as thick as Medium #16 Braid. WHY USE IT: To get a bold metallic look in a design (stronger light and visual effect than the whispy Blending Filament, for example). It can be used right alongside other types of fibers—in fact, that makes a design more interesting. HOW TO USE IT: Straight off the reel. Just cut a length (about 15 to 18 inches) and go. Don't try to separate it or use more than one strand. WHERE TO USE IT*: This thread was created to be the same thickness as two strands of embroidery floss. So it provides excellent coverage in cross stitch on 14-count Aida. It is also popular for needlepoint in tent stitch on 18-mesh canvas. NEEDLE SIZE: Make sure your needle is large enough to accommodate the thread, otherwise the metallic will shred as you stitch. We suggest Tapestry #22 or #24 for needlepoint and cross stitch. For embroidery or quilting on fabric, use a #20 Chenille needle. CARE: This metallic can be washed by hand or machine. Tumble dry on low. Do not iron directly onto the metallic, use a press cloth. * SIDE NOTE ON WHERE TO USE IT: These recommendations are not set in stone—feel free to use other thread sizes on these fabric/canvas counts if desired, or depending on your stitch selection. Some people prefer a lighter look on 14-count Aida, for instance, and instead choose to use Very Fine #4 Braid. Some needlepointers prefer thicker coverage on 18-mesh, so they select slightly heavier Tapestry #12 Braid. Experiment with your own preferences and design needs. Kreinik Iron-on metallic threads make it easy to add sparkle to story quilts, miniature quilts, wall hangings, fiber art, crazy quilts, ornaments, lampshades and other fabric projects. 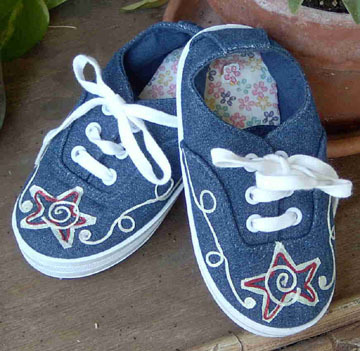 Create outlines, swirls, borders, bows, webs, and words without the mess of glue or taking the time to stitch an embellishment. When you want a quick embellishment, these fibers are perfect. They come in two sizes: round Medium #16 Braid and flat 1/8” Ribbon. First, while your iron is unplugged, apply the Adhesive Press Cloth to the plate of your iron. Trim if needed. If you get any bubbles, smooth them out with your fingers, or pop them with a pin and then smooth the area. Turn your iron onto high and allow it to heat thoroughly (“high” may also be the “linen” setting on some irons). The iron must be on high heat for the thread to adhere properly. Press with iron for a few seconds or until the thread adheres. Follow this procedure, working one section at a time for the rest of your design. “Can they be washed?” Yes, and no. Yes, they can be washed, but sometimes the agitation of a washing machine can make them pop off. If so, touch up with a hot iron. We recommend, however, that you couch them down after placement if using on anything that will need to be washed. That will make them secure. “Can you also use them on paper?” Yes, use these fibers on wood, paper, fabric. You can use them on stitched needlepoint and cross stitch designs. Use them with polymer clay for jewelry too. “Are they suitable for all ages?” As long as a child is old enough to handle a hot iron, they should be fine. We have taught elementary school aged children, with adult supervision, and everyone had a great time. “Do you have to use a craft iron?” You can use a home iron as well. The key is that your iron should have a non-stick coating to keep the adhesive in the thread from sticking to your iron. If your iron isn’t non-stick, simply use a Kreinik Adhesive Press Cloth (available in different sizes).